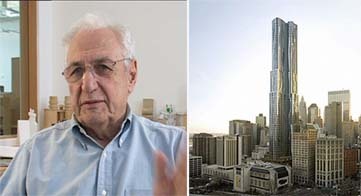 Developer Forest City Ratner is conducting a study to assess costs, risks and timing for work at its Beekman Tower, designed by architect Frank Gehry, in the Financial District. Curbed reports rumors of construction stopping on the 76-story building. The developer has received a building permit that allows the top of the current structure — now 38 stories — to be the building’s roof, WNYC reported. The building started getting its exterior wavy metal panels earlier this month.